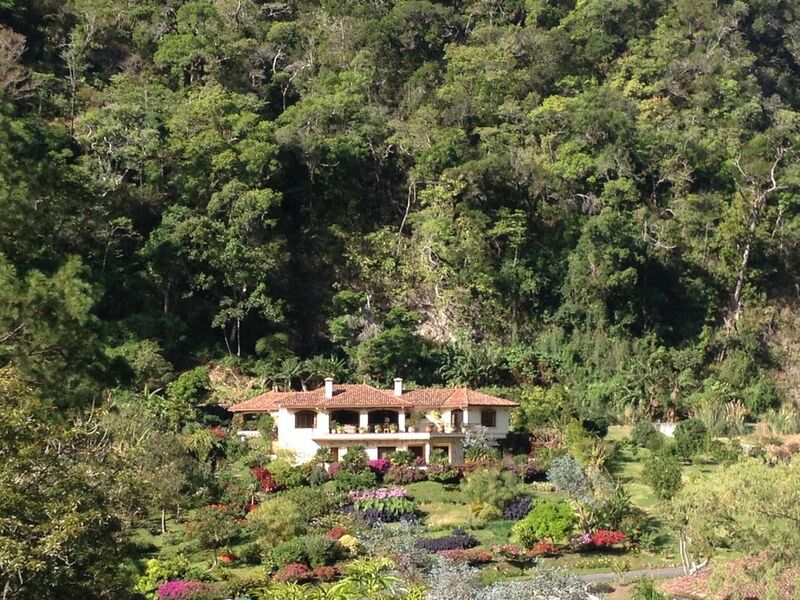 Luxury estate home is located in the exclusive, securely gated resort community of Valle Escondido, Boquete, Panama. This stunning home is in the private estates section of Valle Escondido, with large secluded lot, panoramic views, extensive gardens, including numerous varieties of tropical flowers, water features, coffee, herbs, vegetables, as well as, a spectacular number of tropical birds. This rental includes country club membership with tennis, racquet ball, fitness/wellness center, swimming pool, and spa, golf. Surrounded by spectacular tropical gardens, citrus grove, and small coffee plantation, this beautifully decorated home features 3 bedrooms, 3 marble and tile baths (2 master bedroom suites), indoor and outdoor living areas, 2 gas fireplaces, fully equipped gourmet kitchen, custom cabinetry throughout home, as well as, three times a week maid service and 24 hour security. Also included is high speed internet, cable TV package (126 channels plus US and music channels), and DVD. Valle Escondido is just a short 10 minute walk from the charming village of Boquete where you can find supermarkets, restaurants, entertainment,and shopping. Boquete, a city of flowers, festivals, folk art and dancing,is renowned for growing some of the best coffee in the world, including the famous geisha coffee. Several excellent coffee tours are available . Experience the fresh mountain breeze (temperatures range from 60F to 85F); view the natural beauty of mountains, rivers, waterfalls, tropical gardens; and enjoy hiking, biking, horseback riding, rafting, canopy tours, birding, and dancing. This unique property, gated and with full security, is just minutes away from all the restaurants and attractions in Boquete. It is one of the largest lots in the estate section of Valle Escondido, exceedingly quiet and private. The gardens are a profusion of flowers, fruits and tropical plants which attract multiple species of birds. The home is meticulously maintained, tastefully furnished, with exotic rustic and contemporary furniture. The owners are pleased to help you plan your Panama vacation and offer travel advice. The rental is all inclusive, including utilities, WiFi, cable TV , maid and gardener services, fitness center, golf and tennis. Gardens include multiple citrus trees, coffee trees, bananas, plus herbs and greens available in season. We stayed in Craig's house for 5 nights over new years. What a great home, with everything you could want. We enjoyed the facilities (Golf, Indoor Pool, Gardens). Craig had a full book of recommendations for food and activities which was very helpful being our first time visiting. We would 100% book with him again and hope to return to his beautiful oasis in the mountains. Perfect for our family trip! The house was well-appointed and we'll maintained with beautiful gardens and fruit trees. The neighborhood is quiet and safe, and close to downtown. We loved our stay. Beautiful ground well maintained. Home, too. Spacious for two couples. Appointments exceptionally well chosen. The house had everything we needed. Craig responded quickly and was ready to help if anything was needed. The housekeeper is very sweet and accommodating. The veranda with fire place was well used as the view from it is beautiful. Lovely property and hosts, highly recommended. Our stay in Boquete was very comfortable, and we found this house to be in a perfect location if you have a vehicle. We stayed with our two children and loved our time there. Highly recommend it! The house is just beautiful and amazing. We spent the week with another couple and had a lot of fun. The caretaker was very nice. The gardener set out bananas from the property for us to feed the birds. Although we knowingly visited during the rainy season - with the amazing patio, our visiting and wine tasting was not interrupted in the least bit by the weather. The owner made great arrangements for us to arrive VERY late. Security escorted us right to the door and gave us the keys. We highly recommend the house.